A man had two young children. 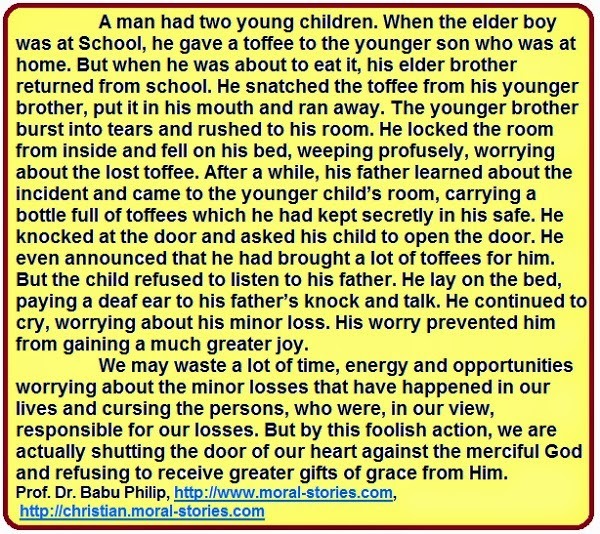 When the elder boy was at School, he gave a toffee to the younger son who was at home. But when he was about to eat it, his elder brother returned from school. He snatched the toffee from his younger brother, put it in his mouth and ran away. The younger brother burst into tears and rushed to his room. He locked the room from inside and fell on his bed, weeping profusely, worrying about the lost toffee. After a while, his father learned about the incident and came to the younger child’s room, carrying a bottle full of toffees which he had kept secretly in his safe. He knocked at the door and asked his child to open the door. He even announced that he had brought a lot of toffees for him. But the child refused to listen to his father. He lay on the bed, paying a deaf ear to his father’s knock and talk. He continued to cry, worrying about his minor loss. His worry prevented him from gaining a much greater joy. A famous painting portrays God knocking at a ‘door without a handle’. The door represents the mind of man which has to be opened from inside in response to the knocking from the outside. God does not open the door of our mind by force. This message teaches us that God is knocking at the door of our heart, awaiting our invitation to enter and be with us, to console us and shower His infinite blessings upon us. It is said that though God is omnipotent and omnipresent, the human mind is a special place where He enters only with our consent. He has granted us the freedom to frame our attitude to Him. We may waste a lot of time, energy and opportunities worrying about the minor losses that have happened in our lives and cursing the persons, who were, in our view, responsible for our losses. But by this foolish action, we are actually shutting the door of our heart against the merciful God and refusing to receive greater gifts of grace from our loving Lord. We must accept moments of pain and apparent losses we may encounter in our life as parts of God’s plan for our ultimate victory and prosperity. Let us open the doors of our heart and greet our loving God with pleasure. Let us seek His blessings and request Him to purify our heads, hearts, hands and habits. This is Story No. 224 in this site. Please click ‘Older Posts’ at the bottom of a page to read previous stories and click 'Newer Posts' at the bottom of a page to read newer stories in this site. Please click on a word in the 'Story Themes' to read stories on that theme.